The summer chinook salmon are gone from Sooke's waters, moved on to their rivers of origin to spawn ... hopefully creating some trophy tyees for local waters in 4-5 years from now. 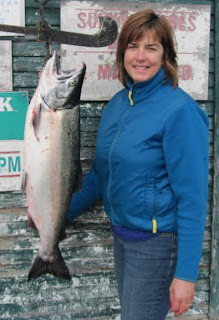 But the autumn fishing in Sooke is good right now, with lots of coho salmon around. These are caught from East Sooke all the way past Otter Point, in the deep water, 250-600 feet. Depths vary, but 50-90 feet seems to be the most common ... though some days it seems they are only biting deeper. Anglers are using both anchovies and hootchies with success -- as some say these aggressive fish will attack pretty much anything that passes by their nose. Last weekend saw the 1st Annual Thanksgiving Coho Derby in Sooke. The event raised $1,800 for the Charters Creek Salmon Interpretative Centre, plus over 500 pounds of of fillets for the Food Bank. Bob Pincombe won it (though his son Jamie claims the expertise), with 16 pounder. They caught it in front of the trailer park in about 220ft depth, at 65 ft with a green glow and white squirt. The first weekend in October was the Sooke Salmon Enhancement Society netting their broodstock in the Sooke River. An excellent volunteer turnout for a very successful taking ... some really big coho and chinook in the river. These are the ones that eluded you all year, and now get the chance to pass their genes on. Great stuff! To volunteer or donate to SSES, visit the website www.sookesalmonenhancementsociety.com If you love fishing in Sooke, then give a little back, and help preserve the fun for your kids and future generations.